J.J Abrams' work on the Star Trek franchise has resulted in it's highest grossing entries in 2009 and 2013 respectively; now, Fast & Furious director Justin Lin takes the helm in this year's Star Trek Beyond, the next stage in the series, and certainly a satisfying threequel that will please Trekkies and general viewers alike, even if it may not feel as refined as it's predecessors. 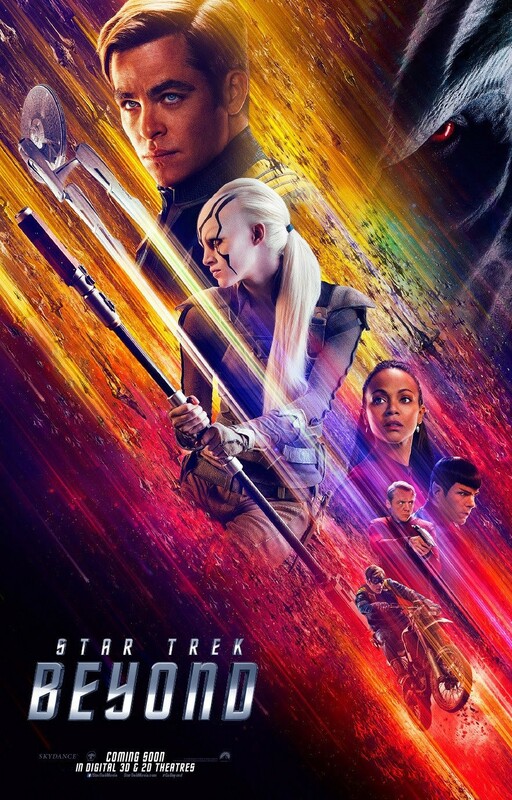 After following a distress signal to a remote part of the galaxy, the crew of the USS Enterprise, lead by James Kirk (Chris Pine), are mercilessly attacked by the sinister Krall (Idris Elba) and his gargantuan armies, who seek a hidden artefact on board the Enterprise that the crew found on their travels. 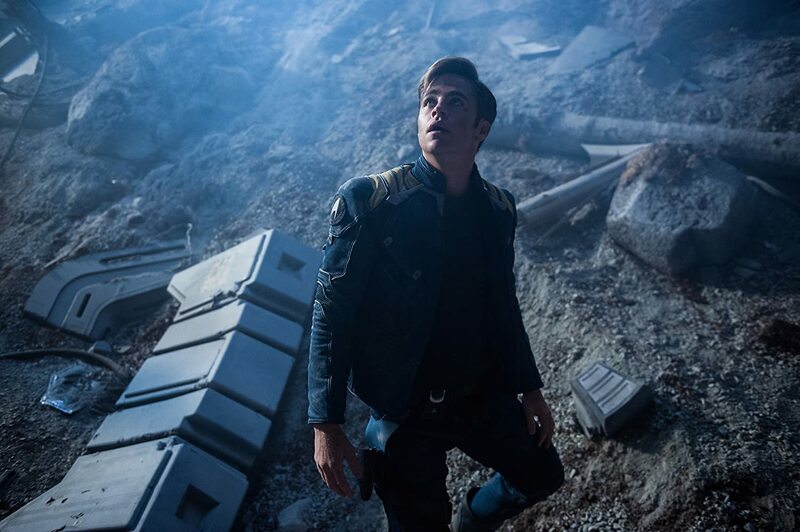 With the Enterprise destroyed and the entire crew marooned on a nearby rogue planet, Kirk, alongside other escapees Spock (Zachary Quinto), Bones (Karl Urban), and Scotty (Simon Pegg), must use all resources they have to locate the truth behind Krall's actions and bring a stop to his future plans before time runs out. What's immediate about Star Trek Beyond is that, aside from a distinct lack of lens flares, it focuses less on space settings and more on the ground - taking place for the most part on the planet of Altamid, where the crew find themselves stranded after their ships destruction in an admittedly amazing action sequence. The film gets off to a suitably quick start, skipping on unnecessary exposition, and has one hell of a gripping climax - but the key weakness lies in it's middle portion, which can drag and occasionally lack consistent focus, considering it has to span over multiple characters in different locales. Idris Elba, while giving a solid performance as the antagonist Krall, can't completely save him from lacking enough development to make him fully interesting beyond a badass appearance and an intimidating presence. Otherwise, his backstory, motivations, and overall characterization isn't explored enough to make him a truly worthy villain compared to those in the previous films. But Simon Pegg and Doug Jung's screenplay is rich in humour, which is brought to life by superb performances by the same fantastic cast, as well some multiple gripping set pieces as we approach the final act. The narrative fits together nicely we near said conclusion; it's just a shame it's not conveyed as well as it could've been, thus making it a bit too vague. From a visual perspective, everything is spot on; CGI work when it comes to the outer space sequences is composed with brilliant attention to detail and animated flawlessly, as is the set design, cinematography across all of the varied locales, as well as the make-up on the individual alien characters. 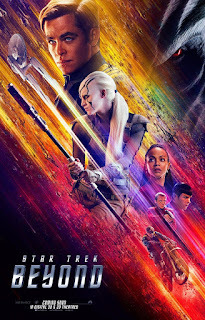 Again, while not as fresh as it's predecessors, Star Trek Beyond is still a potent action film and a satisfying watch from start to finish; helping to continue the series' cinematic comeback in suitably epic fashion.